Spain  2011  95m   Directed by: Nacho Vigalondo.  Starring: Julián Villagrán, Michelle Jenner, Carlos Areces, Raúl Cimas, Miguel Noguera.  Music by: Jorge Magaz. There are so many great films coming out lately from around the world. What's crazy is that some of the ones that get the most praise don't always connect with everyone. 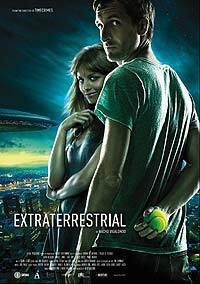 The Spanish made film Extraterrestrial is the latest meeting this criteria, but also sports the sci-fi comedy genre that gives it the unique opportunity to deliver something new to the genre, but can it make it work or will it just be a wasted invasion. Extraterrestrial follows a guy and girl as they wake up from an apparent one night stand only to find out that the world is full of UFO's. As if that wasn't enough, they have to deal with the girl's boyfriend and the creepy neighbor which might be even more trouble than the invasion. On the surface this movie works pretty well, but overall it misses the mark at times. The cast is great and do a great job bouncing off the clever dialogue to create a dry funny overall film. What takes somewhat away from this movie is the UFO aspect. While this does set up some reasoning behind the bigger story for them to play off of, it really serves little to no purpose for the film itself. There is nothing ever really done with it other than being a back drop and makes the final experience seem a bit lacking. Another major issue is the ending. It builds up with all the tensions and issues with all involved only to just kind of end with little to no resolution. Believe it or not this is an entertaining movie that should have been way better than it was. Overall once it ends, it just feels like it was all for nothing since nothing ever really happens. If you're looking for something a bit different then this movie will entertain and do the job, just be sure to steer clear of the expectations of the sci-fi aspect. Be warned, this is a subtitled movie so unless you speak Spanish be prepared to read. Review by rgblakey from the Internet Movie Database.